Can Peach Pits, Walnut Shells Power Your Cell Phone? 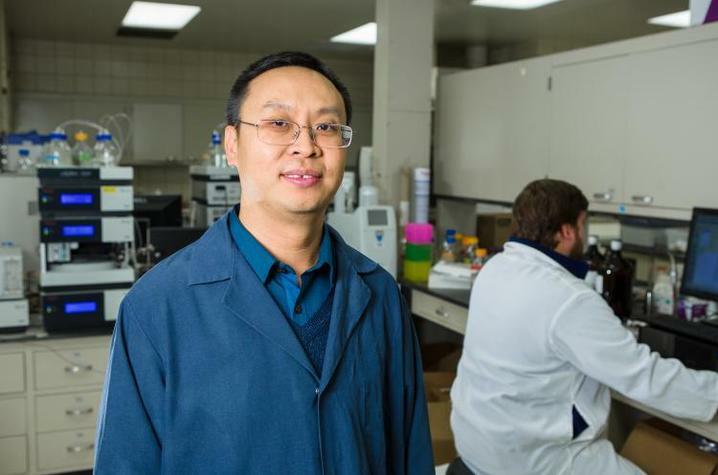 Jian Shi in his lab at UK. Photo by Matt Barton, UK Ag Communications. LEXINGTON, Ky. (Aug. 22, 2018) – A new study by University of Kentucky researchers is examining whether peach pits and walnut shells can be used to create cheaper, longer lasting lithium ion batteries. The three-year project led by Jian Shi, assistant professor in the UK College of Agriculture, Food and Environment, will study whether lignin, a component of cell walls in woody plants and stone fruits, can be efficiently extracted and processed with silicon nanoparticles to form composite materials for battery electrodes. If successful, UK researchers are particularly interested in using the technology to produce batteries for cell phones and electric cars. Seth DeBolt, UK horticulture professor, and Yang-Tse Cheng, the Frank J. Derbyshire Professor of Materials Science in the UK College of Engineering, are collaborating with Shi on the project. They received a $500,000 grant from the U.S. Department of Agriculture, National Institute for Food and Agriculture, Challenge Area. It was one of 10 projects selected nationwide. UK researchers are studying peach pits and black walnut shells because both contain very high amounts of lignin. In addition, black walnuts are found throughout Kentucky, and peaches have been a historically important crop in the Southeast, making both readily available. DeBolt will evaluate potential food waste sources for their lignin content and the availability of each in the southeastern United States. DeBolt has conducted extensive research on biosynthesis of lignin and cellulose in plants. "Tapping extra value from fruit wastes could benefit U.S. farmers," DeBolt said. Once the lignin is extracted and processed with nanoparticles in Shi’s lab, Cheng will test its viability for lithium ion batteries. Cheng has already successfully combined silicon with lignin from trees to make batteries. Cheng anticipates that this multidisciplinary project will stimulate thinking of new ways of turning plant wastes to energy storage materials and devices powering human progress. The project has the potential to greatly improve the economic viability of regional bioenergy systems and to generate extra revenue for U.S. fruit and nut growers and processors.